A very affordable and economical choice for a costume on a budget. 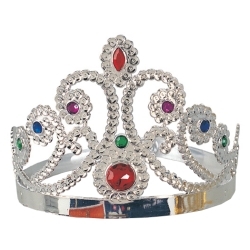 This silver plastic queens crown will adjust to fit snuggly by using a snapping clasp and will fit both kids and adults with up to a 19.5” - 22.5” head measurement. Because of its affordable price many of our customers purchase this item for use not only as a crown but also to be cut up for costume trim and adornment.